Valley Christian senior Anna Collier delivers one of her 82 pitches against Whittier Christian High this past Tuesday as the Lady Crusaders won 6-0. Collier allowed just two hits and faced two batters over the minimum. PHOTO COURTESY OF KATELYN ALBANI. If the Valley Christian High softball team plans to follow the script of the last few seasons, then the beginning of Olympic League play has come at the right time. 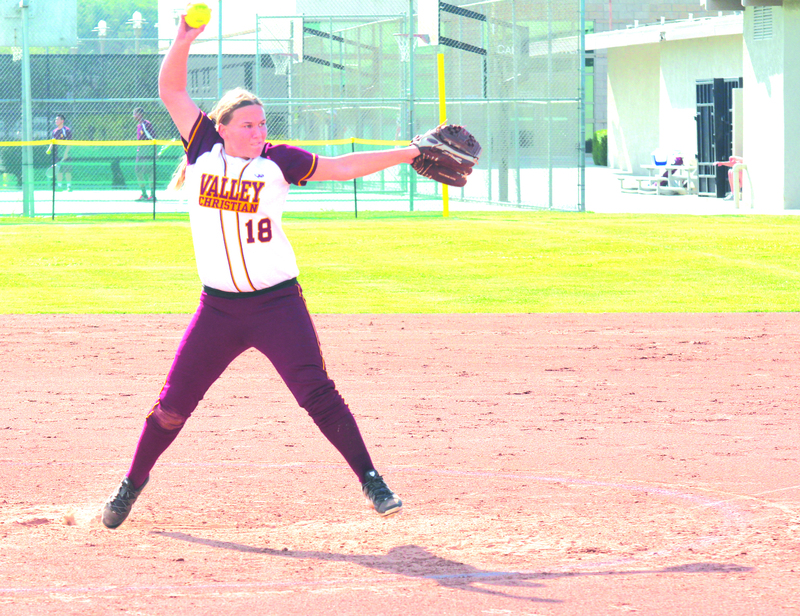 Mired in an eight-game losing streak which has seen the Lady Crusaders score seven runs and produce just 23 hits, V.C. broke out of several slumps and blanked Whittier Christian High 6-0 this past Tuesday. The star of the game, as she has been throughout most of her 24 previous league encounters, was senior pitcher Anna Collier, who faced 23 batters and yielded only two hits. Collier has had a decision in all 25 league games in her high school career and has a league mark of 19-6. Collier’s only blemishes were a first-pitch lead-off ground rule double to Hailey Gallegos in the top of the second inning and a two-out base hit to Ally Udell in the sixth. Both of those runners would be stranded at third. Collier got 10 groundball outs and struck out three. Meanwhile, Collier got the only run support she needed in the bottom of the second. Junior center fielder Brianna Lerma singled, stole a pair of bases and came home on a single from freshman first baseman Katie Morewood. It was just the fourth time this season that the Lady Crusaders had scored in either the first or second inning. The Lady Crusaders (2-12 overall, 1-0 in league) gave Collier more run support in the fourth when junior third baseman Kylie Carr reached on an error and Lerma singled. Morewood’s second single plated Carr and with the bases loaded and two outs, a single to left from freshman catcher Kyla Nunez-O’Leary allowed Lerma to score. The game was put away in the next frame when sophomore designated player Kayla Hoxie singled and moved to second on an error. After Udell walked senior shortstop Chanel Varney and freshman second baseman Morgan McGahey sacrificed both runners over, a groundout from Carr increased the score to 4-0. Lerma followed with a single, allowing Varney to touch home plate. Through five innings, the Lady Crusaders had seven hits, tying for the most in any game this season. They added two more hits in the sixth as Collier and Nunez-O’Leary added to the hit parade. “I think what we did is we went back to basics in practice,” Nicole McGahey said. “We started going back to the very beginning of hitting stages and re-teaching and recalculating and readjusting. The girls finally just made that switch in their mind. Lerma went three for three while Morewood and Nunez-O’Leary each went two for three and drove in a pair of runs. “It’s always an advantage being at home,” Collier said. “They challenge me every game. Even with the score [6-0], it was still a hard game to pitch. They have good batters; they’ve been coached well. I wouldn’t say that I have their number at all. I think it just depends on the game. The slow start isn’t new to the V.C. softball program but sometimes it’s not how you start, it’s how you finish. Two seasons ago, V.C. began the season at 1-13 before its league opener. In the fourth league game of her sophomore season, Collier baffled the Whittier Christian bats on the road in a 10-2 victory. The Lady Crusaders would go 7-1 in league. Then last season, V.C. began with two wins in its first 12 games and was 7-10 before the league opener. In the previous three seasons, the Lady Crusaders have split the season series with the Heralds. The Lady Crusaders visited Oxford Academy on Apr. 7 and will play a doubleheader at Western High on Saturday. V.C. will then host John Glenn High on Tuesday before returning to league action against Heritage Christian High on Thursday.